The 9.0 magnitude earthquake and following tsunami on March 11 has seen a rush by officials to gain control of power plants in the north-east of the country. “Nuclear safety officials had insisted they had no plans to raise the severity of the crisis from five – the same level as the Three Mile Island accident in 1979 – according to the international nuclear and radiological event scale. Fukushima nuclear power plant has been closely scrutinised as reports flow in on the progress of the situation – Japan’s nuclear board previoulsy raised the nuclear alert level from four to five in the weeks following the disaster and the JAIF warned of products such as dairy and spinach being restricted for shipping. 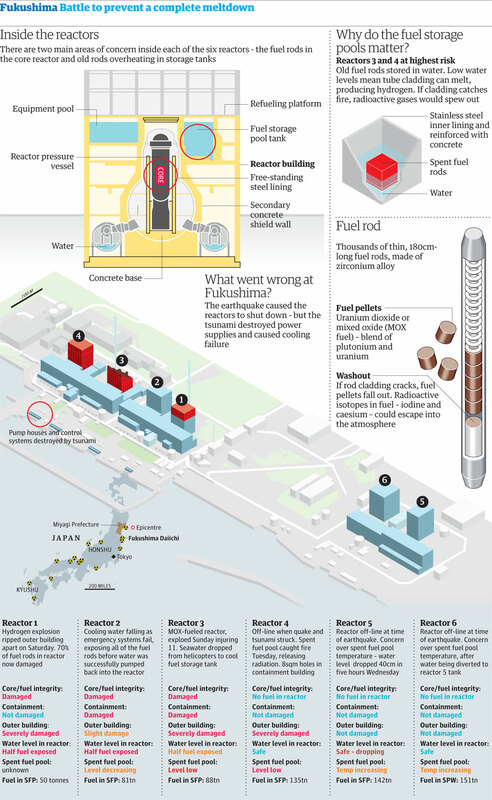 Explosions and reports of nuclear fuel rods melting at the power plant have meant progress on the situation has been closely followed as has the environmental effects with concerns for marine life and spreading radiation through seawater. Industry body the Japan Atomic Industrial Forum are currently publishing daily updates of the status of power plants in Fukushima which give great detail into the condition of each reactor. Ranked from a level of low to severe, the update records the conditions of core and fuel integrity, water level and containment amongst other key information. These are some of the most in-depth and recent records and show how the crisis is being handled. The dangers facing those working at the plant continues to be a subject of concern as does radiation seeping into drinking water, after twice the safe level of radioactive iodine for young children, was found in Tokyo tap water. 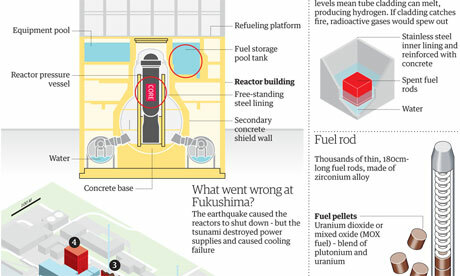 The table below shows the status of the reactors in the Fukushima Daiichi (the largest of the Fukushima power plants) and is colour coded to show the severity. Green for low, yellow represents high and red shows those of severe significance as judged by the JAIF. We have used JAIF’s update 87 as of 20:00 local time as this is the most up to the minute data we can get. A table of major incidents and accidents at the plants can be found in our spreadsheet as can the data for Daini, Onagawa and Tokai Daini Nuclear power stations. What can you do with this data? <5>The 20km evacuation zone around the Fukushima Daiichi NPS is to be expanded so as to include the area, where annual radiation exposure is expected to be above 20mSv. People in the expanded zone are ordered to evacuate within a month or so. People living in the 20 to 30km and other than the expanded evacuation area mentioned above, are asked to get prepared for staying indoors or evacuation in an emergency (issued on Apr. 11th). Radiation dose higher than 1000 mSv was measured at the surface of water accumulated on the basement of Unit 2 turbine building and in the tunnel for laying piping outside the building, or trench, on Mar. 27th. Radioactive materials exceeding the regulatory limit have been detected from seawater sample collected in the sea surrounding the Fukushima Dai-ichi NPS since Mar. 21st. On Apr. 5th, 7.5 million times the legal limit of radioactive iodine, I-131, was detected from the seawater, which had been sampled near the water intake of Unit 2 on Apr. 2nd. It was found on Apr. 2nd that there was highly radioactive (more than 1000mSv/hr) water in the concrete pit housing electrical cables and this water was leaking into the sea through cracks on the concrete wall. It was confirmed on Apr. 6th that the leakage of water stopped after injecting a hardening agent into holes drilled around the pit. Release of some 10,000 tons of low level radioactive wastewater into the sea began on Apr. 4th, in order to make room for the highly radioactive water mentioned above. TEPCO and MEXT have expanded the monitoring for the surrounding sea area since Apr. 4th. Small fish caught in waters off the coast of Ibaraki on Apr. 4 have been found to contain radioactive cesium above the legal limit on Apr. 5th. It was decided on Apr. 5th that as a legal limit of radioactive iodine, the same amount for vegetables should be applied to fishery products for the time being.